Chinese President Xi Jinping and Japanese PM Shinzo Abe met on the sidelines of the Asia-Pacific Economic Co-operation (Apec) summit in Beijing. In a speech to Apec, President Obama has meanwhile announced big changes to visa arrangements with China. Multiple entry short-term visas for businessmen and tourists will be extended to 10 years - up from one year. Mr Obama also stressed the importance of ties between China and the US, saying "the US welcomes the rise of a prosperous, peaceful and stable China." His comments come amid underlying tension between the US and China over Beijing's growing regional influence. 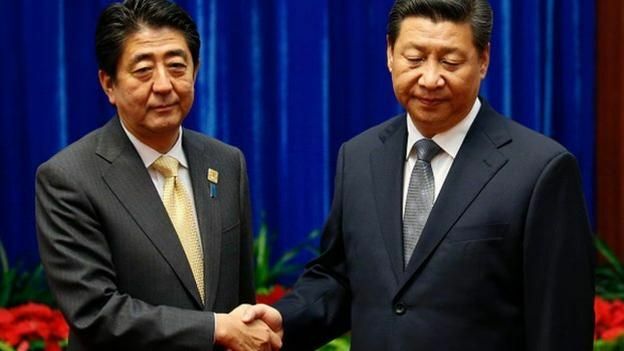 After two years of Chinese animosity towards Japan's new prime minister, President Xi has finally relented. Today's face-to-face meeting with Shinzo Abe is important progress in relations between the world's second and third largest economies. But the underlying disagreements over territory and history remain as bitter as ever. And even Mr Xi's body language at today's meeting was calculatedly icy. During the handshake he did not smile or respond to Mr Abe's attempt at conversation. For all the fireworks and group photographs, this summit brings together neighbours with different worldviews at a difficult moment in history. Mr Abe said the meeting - which came three days after the two sides agreed to work to prevent the territorial dispute from escalating - was "the first step for improving ties by returning to mutually beneficial relations based on common strategic interests". There have been fears that a clash - accidental or otherwise - between Chinese and Japanese paramilitary vessels patrolling waters around the disputed islands could trigger a conflict. Mr Xi told Mr Abe that China hoped Japan would follow a path of peaceful development and adopt prudent military and security policies. Relations have also been hampered by what China sees as Japan's failure to adequately acknowledge its war-time conduct. Leaders from the 21 Apec member-nations are in Beijing for two days of talks. Apec, which includes 21 Pacific Rim nations, includes 40% of the world's population, with member countries accounting for about 44% of global trade and more than half of global economic output. The summit takes place as China looks to underline its growing status as regional leader and economic giant. It is the biggest event hosted so far by Mr Xi, who took over the Chinese presidency in March 2013, and trade is one of the top priorities. 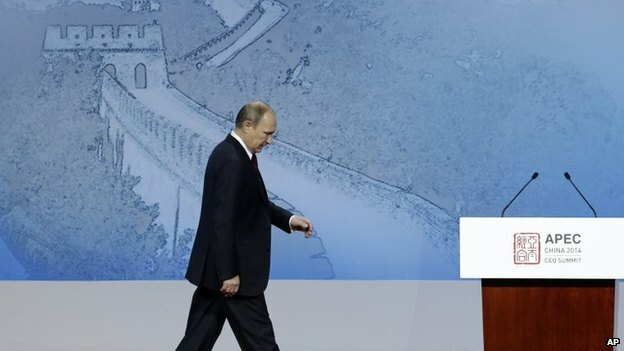 Ahead of the summit Russia and China signed a major gas deal, pledging greater "mutually fruitful co-operation"
Australian PM Tony Abbott is to seek a "robust conversation" with Russia's President Vladimir Putin over the Malaysia Airlines plane brought down over Ukraine.